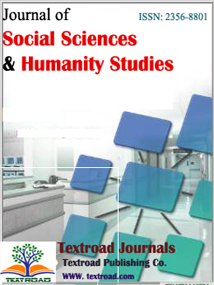 Journal of Social Sciences and Humanity Studies (JSSHS) is a peer reviewed, open access international scientific journal dedicated for publication of high quality original research articles as well as review articles in the all areas of Journal of Social Sciences and Humanity Studies. Copyright © 2017, TEXTROAD. All Rights Reserved.